So last week was a blogging bust for this girl but I’m gonna keep it flowing this week! I have been progressing through my teacher training, perhaps a little slower than I’d like, but making strides none the less! A lot of my home practice and the sequencing I’ve been working on is focused on the basics and it feels quite grounding. I was beginning to get concerned I would lose my ‘harder poses’ with all this focus on smaller, more thoughtful movements but it seems the opposite is true – the more I strengthen my base, the easier it is to fly. 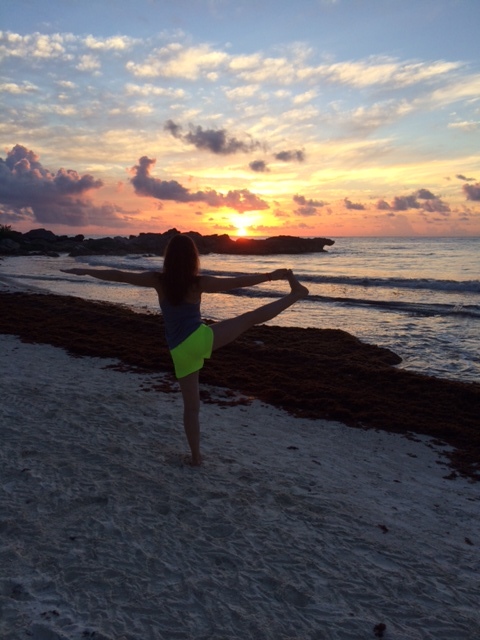 So much of what I see on social media with regard to yoga makes the practice seem unapproachable to your ‘average joe’ which as far as I am concerns defeats the overarching purpose of yoga – connection. Over the next few weeks, that is my focus – connection. On and off the mat I plan to stay focused on the connections, rather than the individual pieces. I am looking forward to bringing that theme to my classes and seeing how I can make it a part of my teaching…I’ve only taught one class so far but I’m planning a Thanksgiving yoga class for Phil’s family and I’m very excited!! The Holiday should be fun! We’re spending Thanksgiving with Phil’s family and I’m so excited they’re all sorts of embracing me ‘uniqueness’ this year – morning yoga, tofurkey and all! ‘Til next time, keep smiling! It snowed here in Philadelphia last night and I for one am not a fan. Its warming up a little but the cold has officially settled in – I guess it’s time to bundle up and break out the comfort recipes. 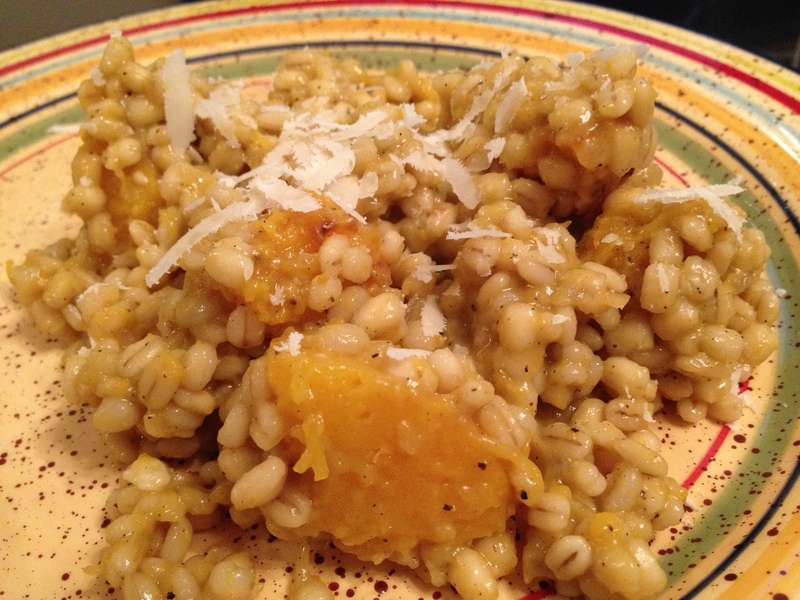 Today’s delicious dish is a Cooking Light adaptation, Butternut Squash and Barley Risotto. I made this a week before Mexico and have been thinking about it ever since. Delectable hot, cold or reheated for leftovers, this hearty health food is so easy to make, my fiance can do it – no offense Phil! Start by peeling and cutting the butternut squash into cubes & putting the stock in a pot to simmer. Toss cubes in 1 tablespoon EVOO, salt/pepper and roast in the oven @ 375 for 30 minutes. While the squash is roasting, dice shallots and garlic to add to a medium sauce pan with the remaining tablespoon of EVOO. Once the shallots and garlic have softened add the cup of barley and season with salt/pepper. After allowing the barley to cook for a few minutes, begin to add the simmering stock, 1/2-1 cup at a time. Continue to stir barley until liquid is almost fully absorbed before adding more and season with sage once all stock has been absorbed. Add the roasted squash as well as 1/2 the cheese & stir until well combined. Season one last time before plating w s/p & top each portion with the remaining cheese. I can’t imagine a better way to spend a cold Friday night than with a plate of risotto, glass of wine and handsome soon-be-to hubby! Looking forward to the weekend – plans with my future brother & sister-in-law, farmers market, tons of cooking for friendsgiving in NJ, swim lessons with my kiddies & YOGA – can’t wait! Happy Hump Day Friends! Are you all shocked I actually posted?!?! ME TOO! I would really love if someone could provide some insight because I can’t figure out why I spend more time ‘getting back into it’ than actually ‘in it’ – what gives?!?! I have to brainstorm ways to keep me on track with my blogging because once every few weeks isn’t cutting it! I am trying to be patient with myself, considering my lack of blogging produced an increase in my journaling efforts, but I would prefer to be doing both. Writing has always been very cathartic for me and I inevitably feel better about anything having spilled my emotions onto a page. I’ve been doing an Energy of Attraction meditation series over the last 10 days and I have to say, its helping keep me calm, happy and focusing on the important stuff throughout the day. I have been struggling with my meditation practice for awhile but Deepak makes it so easy. Physical practice and YTT have been going well – working through some basic sequencing, memorizing the origin & insertion of various muscles throughout the body, and beginning to practice teach is all a bit overwhelming but I’ve committed to keeping calm – this is something I WANT. I’m going to do my best to get a Foodie Friday post up this week and back into the swing of things in weeks to come – maybe be easy on myself and do 3 times a week – see shall see.